In 1992, Columbia’s mayor issued a proclamation, which designated the third week in November as Black Culture Awareness Week. The GOBCC has continued this celebration through a variety of programming, service, leadership, and educational opportunities. The GOBCC’s Black Culture Awareness Week aims to highlight and celebrate our history and fascinating culture to students at the University of Missouri and the Columbia community. 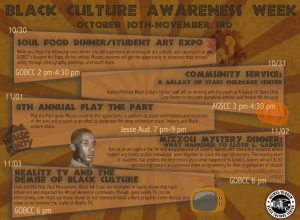 This year’s Black Culture Awareness Week will last from Sunday, October 30th to Friday, November 4th as we bring you a week of fun and educational events!